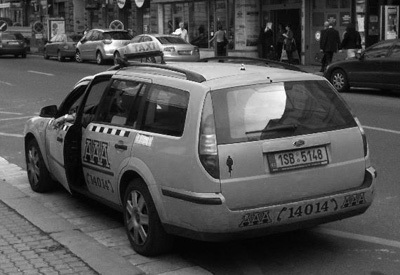 A taxi ride from the airport to city center should cost around 600 korun. A few taxi drivers charged the ‘tourists’ 5000 korun. After many complaints from tourists the city started to listen and did a few things to rectify the problem. Now at the airport you will notice a special place for official Prague taxis. 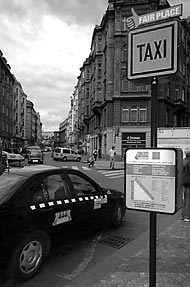 These taxis have a fixed price for specific destinations in the city center. There is no more haggling or surprises - just check the sign for the destination you want to go and it will tell you how much the taxi ride should cost. Also all around the city are designated taxi stops with a sign describing how much you should be paying from one destination to another. For example if you want to go from the Main Train Station to the Airport then simply check the sign and it will tell you how much you should expect to pay. When the taxi arrives confirm with the driver the price and you are safe. Of course, if you hail your own taxi from some random street at 3 am then you are at the taxi driver’s mercy – enter at your own risk. A ride in the district of Prague is around 28.00 korun/km ($1.30 US). The boarding fee is 40 korun ($1.65 US). Waiting is 6.00 korun/1 min ($0.25 US). Do a quick estimate of the number of kilometers from where you are and where you are heading. If the price for the taxi ride is plus or minus 25% then you are fine. If the price is 200% more then I would get another taxi. Since the prices from the airport to city center are fixed you do not necessarily need to tip from the airport. But if you are in a giving mood then 10% is an acceptable amount. Try to round it off to the nearest 20 korun or 50 korun. If the bill is 380 korun then pay the man 400 korun. If the bill is 660 korun then pay 700 korun.